As global supply chains grow more complex, consumers finding it increasingly difficult to know where their products actually come from. 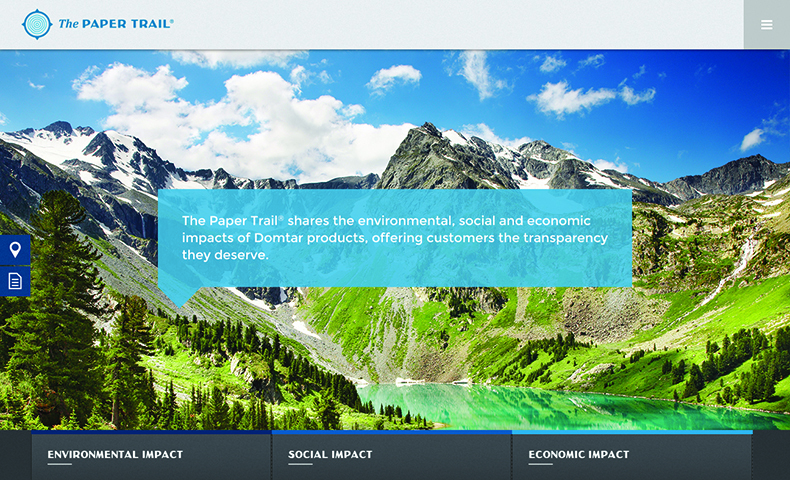 Domtar created The Paper Trail® to increase the supply chain transparency of our products. With The Paper Trail, consumers can better understand the environmental, social and economic impact of the Domtar products they choose. There’s no easy way to trace the materials associated with many everyday products, despite customers’ increasing concerns about the social and environmental impact of their purchasing decisions. As a result of this curiosity and an increasing demand for supply chain transparency, consumers are embracing movements like “farm-to-table,” which encourages local food sourcing. For many consumers, knowing where their burger comes from, understanding how their shampoo was developed and identifying which forests grew the fiber for their printer paper are important details that can help inform how they decrease their environmental and social impact. As a leading provider of a wide variety of forest-based products, we are proud to offer our customers a deeper look into the everyday products that we make. 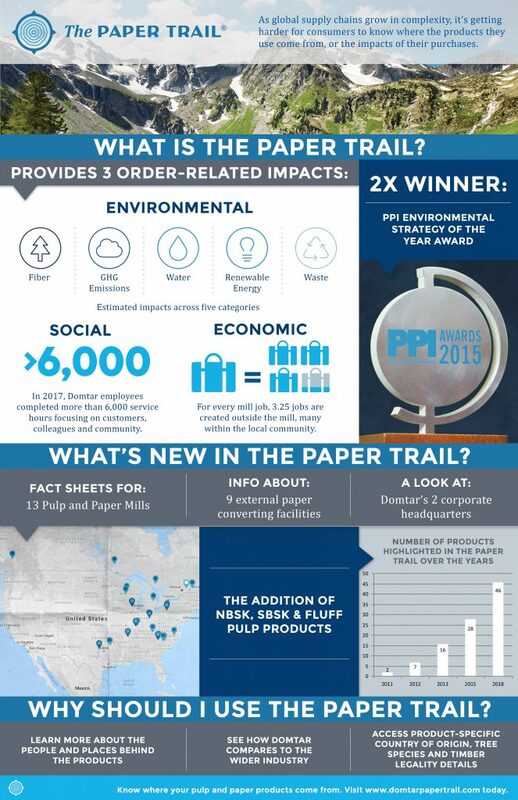 The Paper Trail, introduced in 2011 and recently expanded, offers supply chain transparency, including the environmental, social and economic data of our pulp and paper products. For customers interested in understanding the environmental impact of their purchases, The Paper Trail provides estimates across five environmental categories: wood fiber, greenhouse gas emissions, water, renewable energy and waste. The site also highlights our company’s social impact by including a history of each of our mills, complete with photos of local landmarks and interviews with small landowners who supply Domtar with wood. Visitors to The Paper Trail can also view the economic impact of responsibly crafting products in North America, including industry employment and tax information. Today, all consumers — from the customer who buys one ream of copy paper a year for a home office to the baby diaper manufacturer who purchases tons of fluff pulp every month — can learn more about the Domtar products they use and trust. “Our customers already have high quality standards for our products, so we’re pleased to now offer them unmatched assurance around the sourcing and production of their pulp and paper purchases,” said Lewis Fix, Domtar’s vice president of pulp sales and marketing. By offering a deeper look at the people and places behind the products, Domtar is meeting the market’s growing need for supply chain transparency. Visit www.domtarpapertrail.com to learn more about this award-winning tool, and view more facts about The Paper Trail.